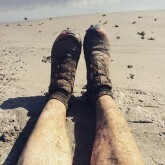 Now that the Australia event has wrapped up (with an unprecedented number of finishers and the first female finisher to boot), the attention is shifted to the upcoming Nicaragua Survival Run. If you have not yet booked accommodation, here’s a little cheat sheet for ya. 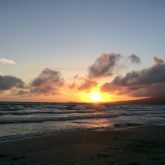 Getting from Managua to the island takes 4-6 hours with all the transitions, so chances are you will need to stay overnight in Managua on your way in, and your way out. 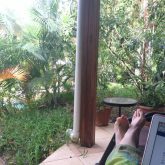 I’d highly recommend Managua Hills – sweet place with a gorgeous garden. The price is right (use code “FyA” for an additional discount), breakfast is included, the wifi is fast, and chances are, you will run into fellow Survival runners over the weekend. Now, let’s take a look at few options on the island. Your fanciest option right at Santo Domingo beach – heck, some of their rooms may even have air conditioning. The beach strip at the hotel is also where the race starts (unless it has been changed from last year), so this is as close as it gets. Fellow junkies, keep in mind that this is one of the places with decent coffee. This hotel is located right next door to Paraiso, and has a 2-night minimum stay. The fanciness factor is dialled down a bit, so you’ll get a break on the price. Cabins sleeping two people start at $49 per night (including all taxes), and you can throw in an additional $6 and include another guest. Puppy piles are the best! There is also pretty solid wifi connection in the common area, if you need to check work emails (like me), or just post half naked selfies of yourself. You can email Sheri (hotelfincadelsol@gmail.com) for any further info. *Also note that the word “finca” refers to a piece of rural or agricultural land, typically with a cottage or a farmhouse present, and often adjacent to a plantation – so you will see this word pop up quite a bit in the names of cottage-y hostels and b&bs. Another popular option with Survival Runners, El Encanto sets up dorm options specifically for the event. 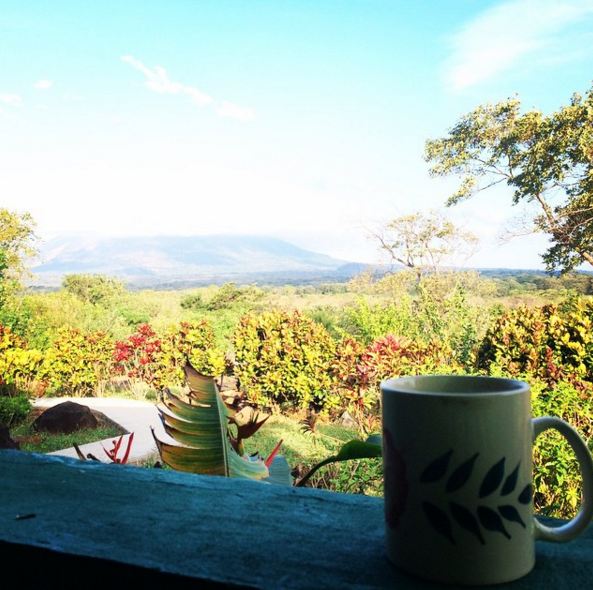 You will also enjoy breathtaking views of the volcano while eating breakfast. Do prepare yourself for a bit of a walk, as the race start line is about 5km away. Currently, only cabins at $55 and $70 are available for the nights around the event, however, there are still some dorm beds, at $15 a night. Wifi is available, but choppy. Carlos Espino is sweet as pie, and is your contact for everything (carloselencanto@gmail.com). Last year we dragged sandbags up a hill somewhere around this lovely spot. This hippy hangout (think yoga, beads and energy) does not take reservations, but people always come and go, so show up at 11am on any day, and chances are, you won’t be turned away. How much, you wonder? Cheap. El Zopilote only has space for 30 people – the cabins for two people are $18, and dorms are $7 a night. You can also sleep in a hammock (omg!) or in your own tent for $4. This would be a place to check out whether or not you are going to stay there, as Thursday night is pizza night! One of the best pizzas of my life has been consumed here. Perfect post-race food. Come early and bring cash (and patience). If you are looking to run into some travelling Australians, ranging in age from 18 to 24, this would be the place. Beer bottles are large, and floors are sticky. These guys do not take reservations either – same deal, knock on their door at 11am, and you may get lucky. The price is right – dorms for $8-10 per person with shared bath, semi-private room $18 with double bed and shared bath, and private room $30 with a double and single bed and private bath. I’d use these guys as a last resort, if nothing else was available. The service is pretty horrendous, and the staff seems to sincerely not give a damn whether you are there or not, but it is a bed, in case you need to crash. Their private rooms with bathrooms and AC will run you $35 + taxes, and rooms with a fan (instead of AC) – $25 + taxes. *For those of you with a bit more tolerance for ambiguity, tighter budget and/or sense of adventure, another option would be to book the stay for the first night or two, and then simply walk along Santo Domingo and ask the locals about room availability. You can expect to pay $8-10 a night for some very basic (rustic?) 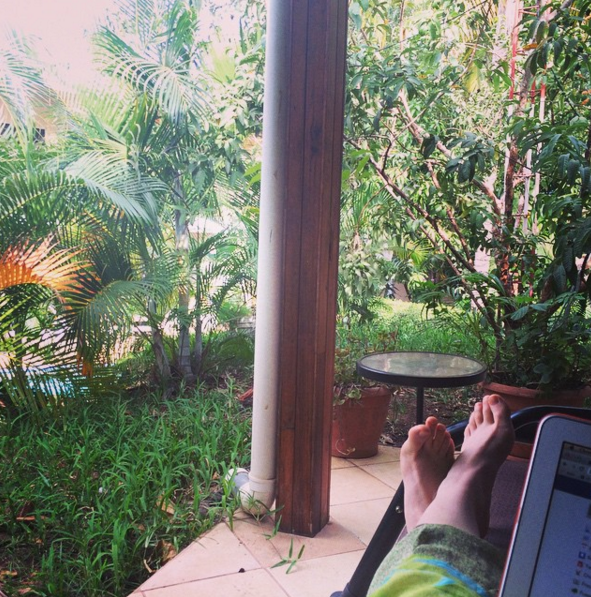 accommodations – think room, bed, chair, table. 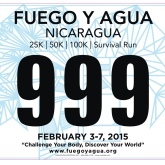 YOUR TURN: If you attended Fuego y Agua Survival Run in one of the previous years, where did you stay? Did I miss any accommodation options that should be listed here? Liked this post? 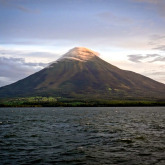 Don’t forget to check out the step by step guide to getting from Managua to Ometepe.